JPS Hands Over 100kW PV Solar System to UTech, Jamaica — UTech, Ja. Ms. Kelly Tomblin (centre), President and CEO, Jamaica Public Service Co. Ltd. (JPS) is delighted to receive an appreciation plaque from Dr. Ruth Potopsingh (5th left) Associate Vice President, Sustainable Energy, University of Technology, Jamaica at a special appreciation luncheon held Monday, July 3, 2017 at the Courtleigh Hotel. 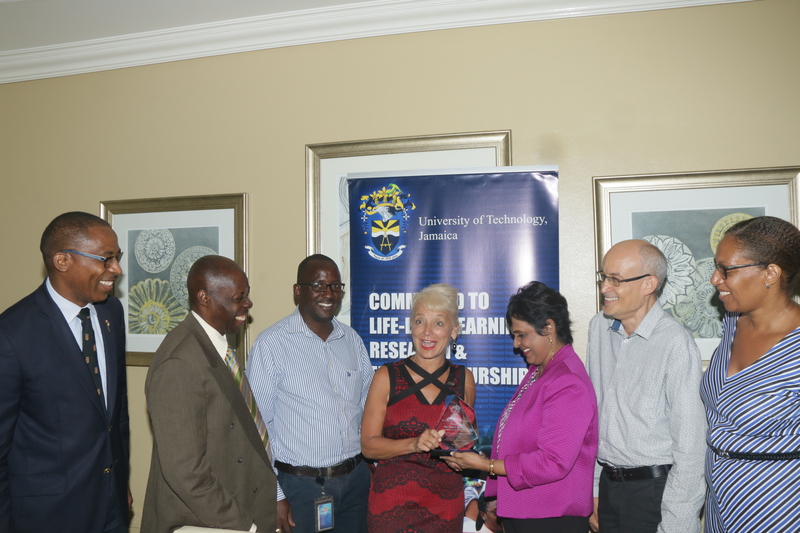 The plaque was presented to Ms. Tomblin for her contribution to renewable energy development and in recognition of the donation of a 100KW Solar PV System to UTech, Jamaica, commissioned at the University’s Papine campus on July 10, 2014. The JPS fully transferred ownership of the project to UTech, Jamaica on April 5, 2017. The Solar plant has significantly supported the University’s electricity needs, reduced operating costs and provided practical training for students. Sharing in the occasion from left, are Dr. Garfield Young, Dean, Faculty of The Built Environment, Mr. Hector Wheeler, Associate Vice President, Advancement, UTech, Ja., Mr. Ian Buchanan, Project Engineer, JPS, Mr. David Cooke, Head, Projects Management and Engineering, JPS and Dr. Therese Chambers, Lecturer, School of Engineering, UTech, Ja.